The semiconductor stock index SMH (NYSEARCA:SMH) has been in a downtrend. You'd think semiconductor stocks should have benefited from Intel's (NASDAQ:INTC) strong pre-announcement. The decline is likely driven by trade war fears. 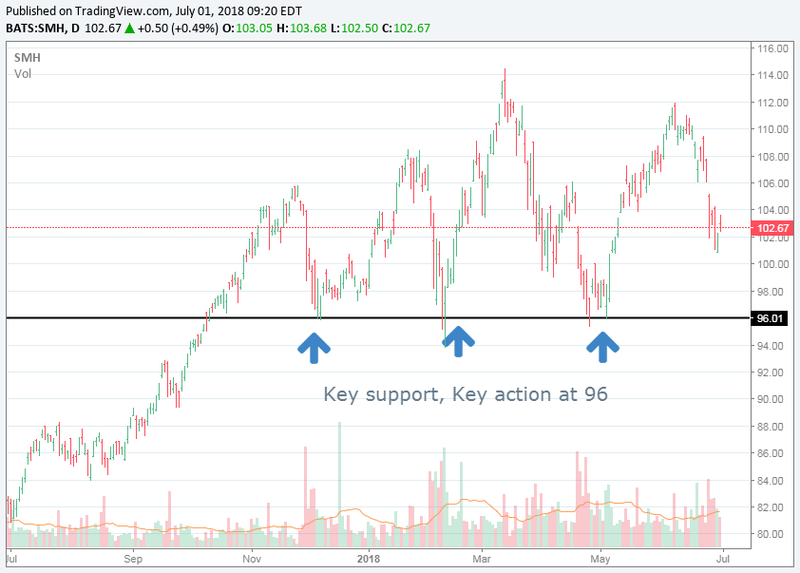 The chart above shows that key action over the last year formed a line of support around $96. The current downtrend of the SMH ETF looks like the index is headed down to support. Unless we get a settlement of this trade dispute we could still have further downside. The Atlanta Fed predictions for Q2 had been 4.7%. The just-released expectation is now 3.8%. The drop could be tied to trade war fears. Businesses could start to reassess their plans for the year. GM, in fact just said tariffs could "lead to a smaller GM." Hyundai said something similar. The longer this now-global trade dispute doesn't get settled, more companies like GM could pull back. The auto industry has been a key driver for semiconductor companies as tech content per vehicle has been increasing. Semiconductor companies also have some of the highest exposures to China of our tech stock coverage. A drawn out fight can hit the SMH ETF. In speaking to the companies we'd guess nobody's seeing a slowdown yet. But as business leaders read the news daily someone might blink which could start a domino of slower orders. Until this trade war sees some resolution we're concerned that the semiconductor ETF SMH might not see support until $96.